The Syrian Arab Army (SAA) and its allies have been stricking miitant positions and supply lines in and near the villages of Lahaya and al-Latamina, which are located about 35km north of the city of Hama. 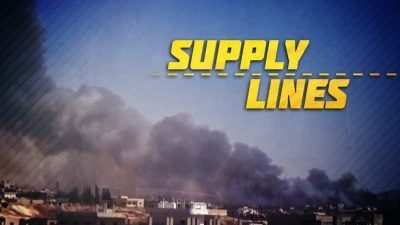 According to pro-government sources, the Syrian military will further work on targeting militant supply lines in northern Hama and southern Idlib. In eastern al-Suwayda, the SAA, the Syrian Social Nationalist Party (SSNP) and other pro-government factions repelled an ISIS attack, which was supported by suicide bombers. According to reports, at least 3 ISIS suicide bombers were killed in the encounter. There are no confirmed reports about casualties among pro-government forces. On August 7, the US-backed Syrian Democratic Forces (SDF) announced their intent to launch a military operation against the ISIS-held pocket of Hajin in the Euphrates Valley. According to the SDF, the previous phase of the operation, which took place in the border area, has finished successfully and preparations for the next phase are now ongoing. On August 6, pro-Kurdish activists released a video showing 200 trucks with weapons, equipment and ammunition sent by the US-led coalition to the SDF in northern Syria. This shipment, aimed at further strengthening the SDF military capabilities, already caused a new round of criticism in Turkish media. Russia is intensifying contacts with various Kurdish organizations amide the slow rapprochement between Damascus and Kurdish factions in Syria. On August 4, a delegation of the International Federation of Kurdish Communities met with Russian Special Presidential Representative for the Middle East and African Countries and Deputy Foreign Minister Mikhail Bogdanov. According to the Russian Foreign Ministry, the sides “discussed the pressing issues in the Middle East with an emphasis on the Kurdish issues in the context of developments in Iraq and Syria, including the need to consolidate international efforts in countering ISIS and other terrorist groups”. Previously, negotiations between the SDF political wing – the Syrian Democratic Council – and the Syrian government had taken place in Damascus marking the improvement of the relations between the sides.